The Hampton Inn - Suites San Antonio - Airport TX hotel is located adjacent to the San Antonio International Airport with everything very accessible from the hotel. If you are here on business or pleasure the popular open floor plan of the bright airy rooms and one room suites will allow you the space to complete the job at hand. Sure to please the busy executive or leisure Texas traveler San Antonio Hampton Inn - Suites hotel guests will enjoy our complimentary On the House hot breakfast buffet served daily. Our hotel offers complimentary stays for children 18 and under with a parent a state-of-the-art exercise facility on the property an expanded business center amenity filled guest rooms with our Cloud 9 Beds and of course our Hilton Honors Points and Miles. 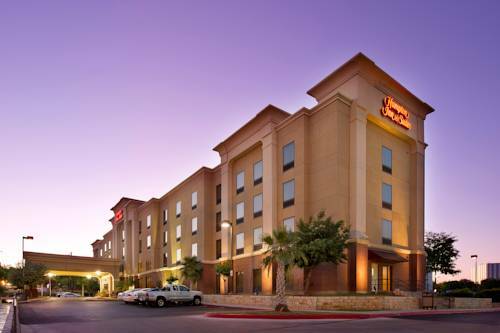 The Hampton Inn - Suites San Antonio - Airport hotel is as close to home as you can get and still be our guest. We love having you here in Texas at the Hampton Inn - Suites San Antonio - Airport hotel. Barbaresco is an Italian restaurant located in San Antonio - Tuscan Cuisine. - San Antonio Convention Ctr.